An all purpose amino acid necessary for growth. L-arginine supports cardiovascular health by increasing nitric oxide production. It also supports muscle recovery after exercise. B-6 is added for enhanced utilization. 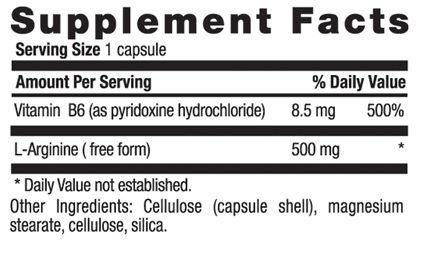 RECOMMENDED USE: Adults take one (1) capsule three times daily, preferably between meals. NO: gluten, yeast, wheat, corn, soy, milk, salt, preservatives, artificial colors, flavors or sweeteners or GMOs. WARNINGS: Consult physician before using if you are pregnant, lactating, using blood thinners, anticipate surgery or are taking multiple medications. Do not use if you have had a myocardial infarction or have established coronary artery disease.